Huge news metalheads – none other than IRON MAIDEN are on tour in 2019, with an all-new show the likes of which you’ve never seen before! And coming from them, that’s really saying something!! Prepare to witness the Legend Of The Beast LIVE at the MGM Grand Garden Arena on Friday 13th September 2019! Tickets expected to sell out FAST – grab yours now while you still have the chance!! 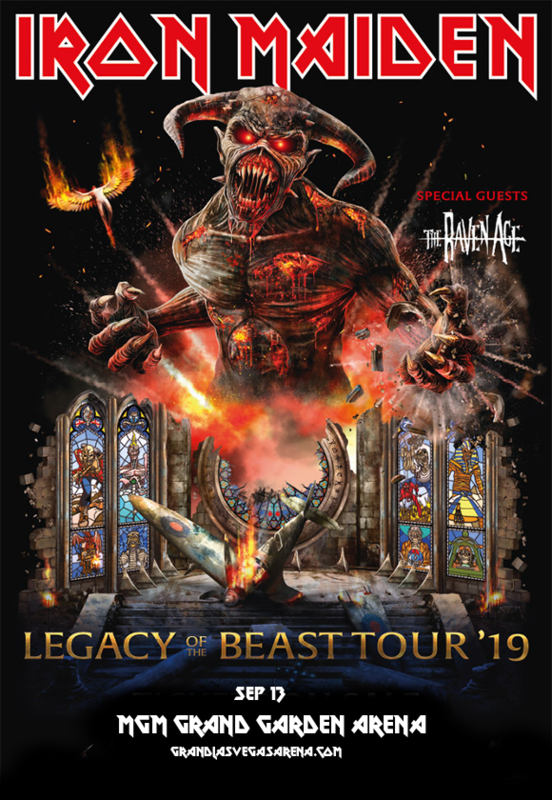 The Legend Of The Beast tour has already been across Europe, and fans have been ecstatic about it – so we’re super psyched to see it here in the United States!! Based off the band’s popular phone game, which takes the band’s mascot, the undead Eddie, through various worlds, the new tour seeks to emulate that, with the stage and set changing around the band as they perform on stage!! It’s set to be a truly exceptional Iron Maiden experience, and this is coming from a band who already blow just about everyone out of the water when it comes to onstage theatrics!! There’s only one way to find out just what the new tour entails – be there!! Hit the “Buy Tickets,” button and get ready to see Iron Maiden live on September 13th! !